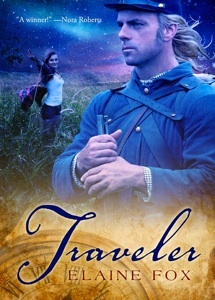 Shelby Manning is living a normal, if uneventful life, in modern-day Virginia when on a cold winter evening she stumbles across Carter Lindsey in a Civil War battlefield park. Bleeding and disoriented, and dressed in Union blue, he seems to think he actually fought in the Battle of Fredericksburg nearly 150 years ago. Believing him to be an injured reenactor, she takes him to the hospital, but though his body heals, his mind is still certain he is not from the present. Maybe she should have written him off as crazy, but there is something about Carter Lindsey that draws her, something in his eyes, in his touch ... in the way she wants to do anything to help him. Swept up in a passion she's never before known, Shelby may not understand what has happened to Carter, but she feels sure of one thing: if she has to defy time itself, they are meant to be together. I was completely prepared for a prudish blush and relished the idea of distracting him with what he would consider shocking boldness. Instead, his eyes narrowed, and his mouth curved into a seductive smile that turned my stomach to jelly. “You could find out,” he offered in that voice, low and smooth as mulled wine.